The space shuttle Discovery delivered a humanoid robot helper called Robonaut 2 to the International Space Station. Life aboard the International Space Station will get a little cushier when a robot butler arrives at the orbiting lab later this week. 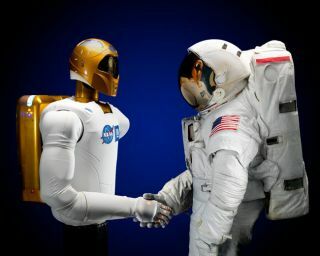 The space shuttle Discovery, slated to launch on Thursday afternoon (Feb. 24), is carrying a humanoid robot named Robonaut 2 up to the orbiting lab. Robonaut 2 — also known as R2 — is a prototype robotic assistant designed to help human crews with chores and repairs. Researchers will use the bot as a test bed to help develop more advanced robotic helpers in the future. Robonaut 2, which will become the first humanoid robot in space, looks a bit like a boxer's training aid. The $2.5 million space bot consists of a head and torso, along with a pair of dexterous arms that pack down into a puncher's pose. R2 stands 3 feet, 4 inches (1.01 meter) tall and weighs about 330 pounds (150 kilograms). R2 is a joint project of NASA and carmaker General Motors. It's the product of a cooperative agreement to develop a robotic assistant that can work alongside humans, whether they're astronauts in space or workers at GM plants here on Earth, NASA officials have said. Each of R2's arms can carry about 20 pounds (9.1 kg), and its hands have articulating fingers and thumbs. The robot, which builds on NASA's work with its first Robonaut project, should be able to use the same tools astronauts on the space station use, agency officials said. Astronauts will install Robonaut 2 inside the station's U.S. Destiny laboratory and put it through some test paces. The goal is to see just what the robot helper can do — how it can work side-by-side with astronauts to make station operations run more smoothly. "We're going to use Robonaut on orbit to learn more about how robots can take over astronaut tasks — some mundane things and then potentially some of the more dangerous tasks," said Scott Higginbotham, payload manager for Discovery's STS-133 mission. Robonaut 2 was designed to use both internal and external interfaces, so future bots could eventually be installed on the station's exterior to aid in spacewalks and other difficult or dangerous tasks. However, R2 itself will likely stay inside, officials said, since the bot lacks protection against the extreme cold of space. As advanced as it is, R2 represents an early stage in the effort to get robots more involved in space travel and exploration. "I think we see Robonaut as the program does — a technology demonstration," said astronaut Michael Barratt, a mission specialist for STS-133. "This is very much a first step, but we’ll be identifying and mapping some of the tasks and capabilities that Robonaut demonstrates over the years." You can follow SPACE.com senior writer Mike Wall on Twitter: @michaeldwall. SPACE.com staff writer Denise Chow (@denisechow) contributed to this story from NASA's Kennedy Space Center in Cape Canaveral, Fla.